Talking Adelaide has been a bit quiet of late. Real Life has been taking precedence over Dream Life. TA will try not to be so neglectful in future. Just found this interior house spread in US Elle Decor and felt like sharing. TA doesn't know of anyone in Adelaide who embraces colour so much. Do you? Would love to know. We tend to love white, white, white. TA got lots of comments when the front door was painted yellow and one bedroom got a pink wall - inspired by US Vogue's European editor-at-large Hamish Bowles' apartment (see below). Hardly splashing about a Pantone chart. 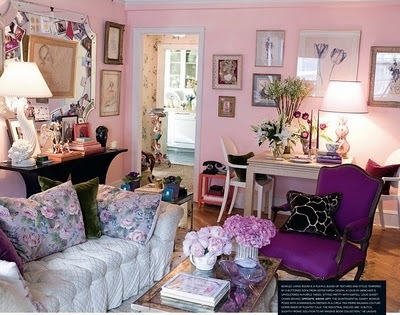 This is a story and picture spread about the home of Oscar de la Renta's publicist Erika Bearman, who I happen to follow on Tumblr - where her mantle is OscarPRGirl. 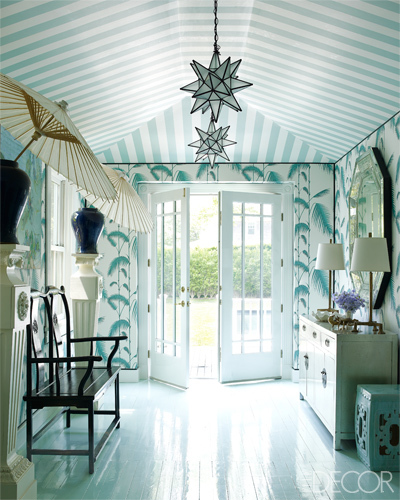 The interior is by hot US interior designer Miles Redd. Not all of it is to my taste but there's plenty to swoon over. Two of my favourite colours appear in the palette - yellow and Tiffany Blue. Enjoy!